NEW YORK, Dec. 6, 2018 /PRNewswire/ -- The English Premier League has announced plans to bring digital learning programs and soccer-themed student engagement activities to elementary schools in the United States. In its first year, Premier League Primary Stars USA will be available to more than 100 schools across five cities. Launching in January 2019, the educational initiative, delivered by leading education technology provider EVERFI, will offer schools free-to-use teaching resources. The materials will be available to download and will focus on three core areas: health and wellness; social learning and digital citizenship. All resources align with curriculum standards and can be used in school computer labs or at home. In this initial year of implementation, the program will be made available to select schools in Atlanta, Boston, New York, San Diego and Tampa Bay. 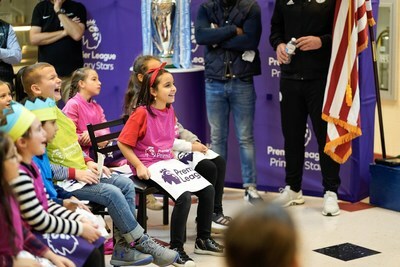 Premier League Primary Stars initially launched in the United Kingdom in 2017 and engages more than 16,000 elementary schools with its free-to-download curriculum-linked teaching resources, which are supported by all 20 Premier League clubs. This program has been adapted for the US curriculum to provide new, exciting resources to support teachers in core education areas. Premier League Managing Director Richard Masters said: "The Premier League and our clubs place great importance on engaging and inspiring communities. Premier League Primary Stars has been a huge success in the UK, where we have seen the power football has to engage children in learning. We are excited to now extend this program to the US with bespoke teaching resources which are designed to inspire children to learn and develop important life skills." EVERFI will support the development of the program's educational materials and help establish Premier League Primary Stars USA. The League plans to work closely with teachers and education providers to continue to develop the program's offer and extend its reach. EVERFI Global Chief Marketing Officer Brian Cooley said: "The Premier League has long been a champion of education opportunity and this program extends that same mission to help educate American students on a number of critically important topics. Helping elementary school students learn about healthy and active lifestyles, while encouraging them to be compassionate and empathetic will be a fantastic complement to their in-school curriculum." To celebrate the announcement, the Premier League hosted a special Premier League Primary Stars USA session at PS 254 Dag Hammarskjold School in Brooklyn, NY. 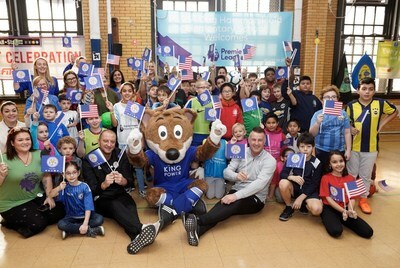 Premier League representatives and coaches from Leicester City joined Premier League club mascots to provide students with a preview of the program in action.